Rack-mounted guitar processors might not be as hip as they once were, but they're still reliable -- and new innovations continue to be made. Witness Rocktron's Prophesy II guitar preamp, which offers fast, powerful, and drop-out-free tone shaping. The preamp section of the Prophesy features four channels, each with its own distinct "voicings" to provide a vast array of desired tube amp sounds. Each voicing may be thought of as a "channel" and each channel has its own basic gain and master controls with bass, mid, treble and presence controls, all easily accessible with "real amp" knobs on the front panel, just like a regular amp head. - Channel 2/"Texas Blues" is a vintage tweed with a bit more "kick" and "bite" often heard from the famous southwest bluesers a la Billy Gibbons, Stevie Ray, Eric Johnson, etc. - Channel 3/"Vintage British" is a traditional "Plexi-style" tone. - Channel 4/"Mega Drive" the ultimate quest for almighty heavy tone of modern music pumping out everything from early Van Halen to Megadeth and everything in between. The preamp section also features a parametric pre EQ, which allows you to "pre-shape" your tone to simulate the characteristics of several different guitars (such as fine-tuning your single-coil pickup to sound more like a humbucker, etc.) as well as an additional parametric post EQ to add extra lows, high, or scoop out the mids. There is also a global parametric EQ to adjust the overall output of the Prophesy on all presets. The effects section of the Prophesy is divided up into two sections: pre distortion (or pre-preamp), and post distortion (or post preamp) for unlimited configurations of effects. The pre-effects section features Wah, Compressor, HUSH, Pre-EQ, as well as one assignable effect of your choice. 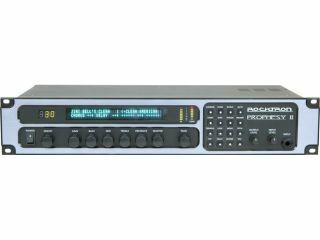 The post-effects section provides ultra-transparent, high-quality effects which completely preserve the tone of the preamp-thick reverbs and lush choruses can be used without coloring the sound of the preamp's tone. Four assignable "effect blocks" allow you to assign one effect pre-preamp and three post preamp effects in any order you choose, including Phaser, Flanger, Chorus, Pitch Shift, Rotary Speaker, Ducker Delay, etc. Prophesy also features a versatile mixer section to control the mix between dry and wet signal output of every effect used in the preset. Rocktron has included a true stereo effect loop, which may be assigned anywhere in the effect chain just like an internal effect. The ADSR (Attack/Decay/Sustain/Release) function features Rocktron's Pluck Detection, which allows you to configure any of the Prophesy parameters to be controlled dynamically by each pluck of a guitar string. Other features include a visual representation of the assigned effects signal chain, preset title, the voicing (channel) being used, are all conveniently displayed on the first preset page. The buttons in the 16-button matrix show the effect status (in or out) as well as allow you to instantly jump to those effects's parameter pages for instant adjustment. It's a pretty big bundle, and it might be just the thing to get you to reconsider racks -- as in mounted effects, that is. The list price on the Prophesy II is $1,799.00US. For more information, visit the official Rocktron website.